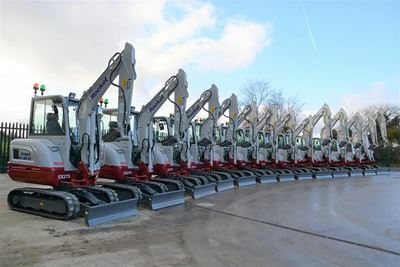 Christmas has come early for Gloucestershire based plant hire company Rocket Rentals and its customers as the family run business has invested £1.2 million in a new fleet of 25 Takeuchi mini excavators, which have been supplied by CBL Plant Sales. Rocket Rentals was founded in 2003 by Managing Director Simon Tomblin, initially starting off with a fleet of 8 telehandlers, which went out on hire to local housebuilders. Over the years that followed other equipment was gradually phased into the fleet, including mini excavators, excavators up to 20 tonnes, dumpers, rollers and access platforms. The fleet just keeps growing to this day and is currently 450 units strong. Takeuchi is a new product for Rocket Rentals, having run a competitive Japanese brand for many years. The deal consists of 8 x TB230 (3 tonne class excavators), 8 x TB260 (6 tonne class excavators) and 6 x TB290 (9 tonne class excavators), with a further 6 TB260’s to follow in the new year. Talking about the deal Simon Tomblin said, “Following a chat with CBL’s Regional Director John Elliott we took a Takeuchi TB260 on demonstration earlier this year, we tried it and compared it to other brands we run and we found that the feedback from our customers was extremely positive. We had no reported problems and discovered that servicing costs were expected to be very low. From my research we expect to see very good residuals on the machines when it comes to trade in time and we feel that Takeuchi is very much a premium brand”. Simon continued, “It’s probably seen as a bold move on our part to buy so many in one hit, but we are convinced our customers will enjoy the Takeuchi product, so much so that we are already looking at investing in the new TB2150R 15 tonne class fixed boom excavator next year”. Talking about Takeuchi CBL Plant Sales Regional Director John Elliott said, “We find that the Takeuchi brand itself is very attractive to independent plant hire company’s like Rocket Rentals, who are not only passionate about the industry, but who want to offer their customers the very best from their investment”. The machines have been supplied with an industry standard for the plant hire sector, including green seatbelt and orange flashing beacons, fully automatic hydraulic quick couplers from Hill Engineering and buckets from Strickland, which are branded and painted in Rocket Rentals corporate colours. The machines also feature the new TSS (Takeuchi Security System) with coded keys for peace of mind. Summarizing about the deal Simon said, “We are also very excited by the fact that we now have a manufacturer in our fleet who can offer us machines ranging from 1 tonnes right up to 15 tonnes, that are all premium products with a very strong following and that our customers will want to use”. “In addition, CBL understand what a customer like me expects and wants from my machines and the deal, because they are in the same boat being a plant hire company too, as such they perform better as a dealer because they understand the rental sector. At the end of the day it’s people and service that makes the difference, if you get those things right, you’re onto a winner”. Concluding John Elliott said, “For us it’s not just about the deal, it’s about how we support it over the coming years, in terms of warranty, service, parts and back up, it’s this level of service that makes the difference for us”. Rocket Rental’s customers cover a broad spectrum including housebuilders, local groundworks companies, civil engineering firms and landscape contractors to name a few, many of whom will be enjoying the new Takeuchi’s when they start going out on hire in the new year. Copyright © 2019 Plant Hire. All rights reserved.